When a new “Curiosity” lands on Mars in 2020, the rover also bears the Norwegian developed instrument, RIMFAX. RIMFAX is short for Radar Imager for Mars’ Subsurface Experiment and is a ground penetrating radar designed to expose the hidden conditions under the surface of Mars. The Ground Penetrating Radar (GPR) is not a new invention, but is used in different missions on Earth to expose conditions under the surface of earth without destruction of the ground. A Chinese built instrument, based on the same principle, has also been used to study the moon’s crust. However, this is first time such an instrument will be sent to Mars. 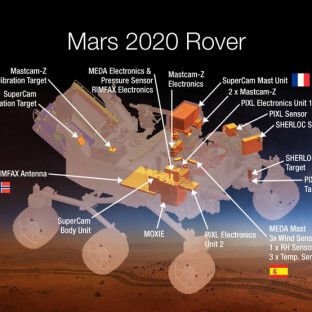 Results from the instrument will complete large-scale measurements from the MARSIS Instrument on board, Mars Express and the SHARAD on board Mars Reconnaissance Orbiter. GPR will send radio frequency electromagnetic waves into the ground and then detect the reflected signal as a function of time to reveal subsurface structure as well as composition. The instrument can detect signals down to between 10 to 100 metres deep in the earth’s ground, depending on the types of ground material. The conditions do not match those on earth, so the depth of penetrating will not necessarily be the same. The Mars Rover, at the moment without any name, will move about 130 metres a day, and the instrument will take two measurements every 10 centimetres. Developing and testing the instrument has been mainly been carried out in Norway. RIMFAX is exclusively based on technology developed by the Norwegian Defence Research Establishment (FFI), and the instrument will also be built at the same institute. To test the instrument in near Mars conditions the team has tested the instrument on Svalbard. Svalbard is cold and dry and has permafrost, conditions, close to and near the same conditions as on Mars, if one ignores the fact that Svalbard has both oxygen, higher gravitation and a protecting magnetic field. of that its came dew in valley.